Turn on grill element in oven. Melt butter or coconut oil in frying pan. Beat eggs and cream cheese with hand held blender then add to frying pan. 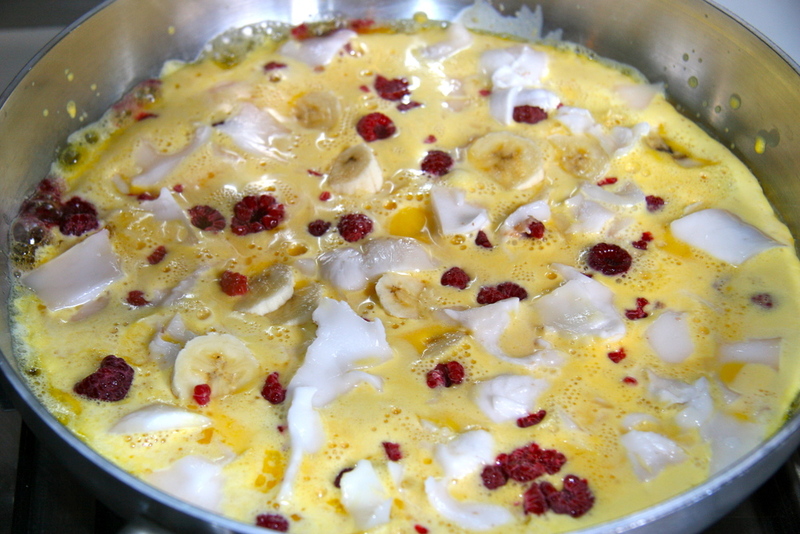 Add banana (I sliced it straight into egg mixture), raspberries and coconut slithers. Cook on gentle heat for approx 5 minutes so that the underside of the pancake is cooked then transfer to oven under grill element so that the top side cooks. This avoids trying to flip the pancake and making a big mess! It is ready when the top is golden brown and the eggs are set. If mixture is still runny add back on stovetop to cook until set. If you have a sweet tooth you could drizzle a little maple syrup over the top when serving (though we didn't need to - the fruit alone is sweet enough for me). I rarely measure anything - I tend to just thrown things together- so the above measurements are approximates. Using the egg mixture as the pancake base you can make whatever variations of the pancake recipe you like! Cool, hey?! The eggs provide much needed brain-loving saturated fat to slow down the release of the sugars contained in the fruit to avoid fluctuations in blood sugar levels with insulin spikes and crashes. The saturated fat in the egg yolks helps with the absorbtion of the fat-soluble vitamins and minerals in the fruit. I hope you enjoy these creations as much as we did! Do you have a grain-free pancake recipe? If so please share it! I've tried using activated nut meal together with the beaten eggs but the mixture is more crumbly /coarse and less smooth than plain eggs (or eggs with cream).